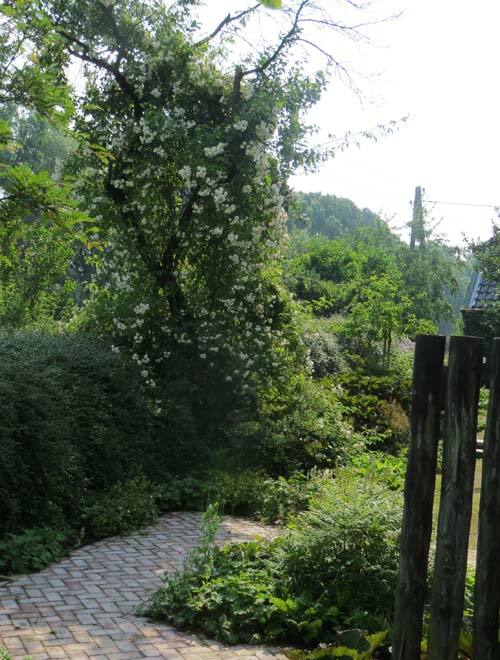 She is the grandmother of all modern gardens and her designs are still an indispensable source for those who want to make a professional career as a garden or landscape architect. 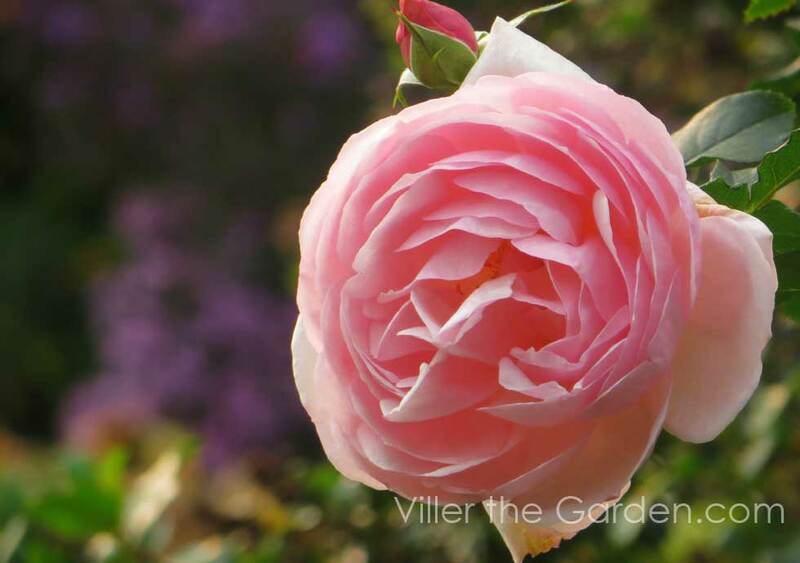 Her name: Gertrude Jekyll. After her death in 1932, all her plans and papers went to her nephew Francis Jekyll who used them to write a biography of his aunt. The reason that her legacy went to the States is still shrouded in a haze of mystery. 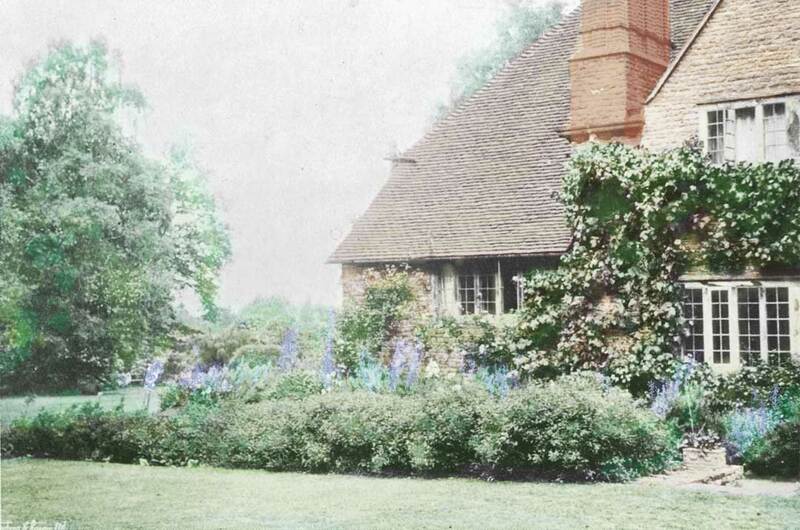 Anyway, it was the famous American Garden architect Beatrix Farrand who finally secured the valuable garden plans. At the end of her life, Farrand donated Miss Jekyll´s books and papers to the University of California at Berkeley where they are now available for inspection. Until recently only a handful of plans were available to her fans. Most published was the design of her own long border at Munstead Wood which was printed over and over in many garden publications. Fortunately, the great lecturer Richard Bisgrove consulted a lot of these unpublished plans to write a very impressive book on the versatility of this grand lady. 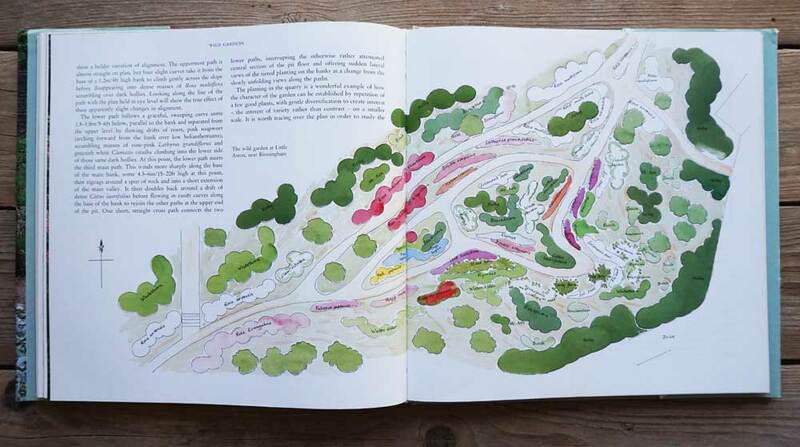 It is really a treat to see a great deal of these unknown planting plans now covered in one single book. Bisgrove painstakingly analysis and describes each project in detail. At the same time, his narrative way of describing is fascinating and easy-to-read. He starts by introducing Gertrude Jekyll to those who are not familiar with the life and work of this great English garden designer. After describing Jekyll’s own garden in Munstead Wood, Bisgrove categorizes the plans in different themes. 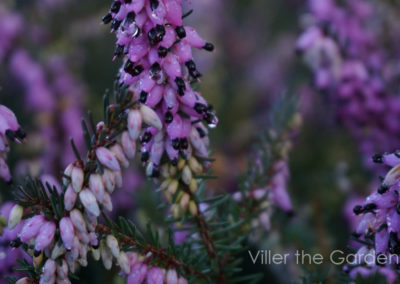 You will find wood gardens and plans where shrubs are playing a vital role. 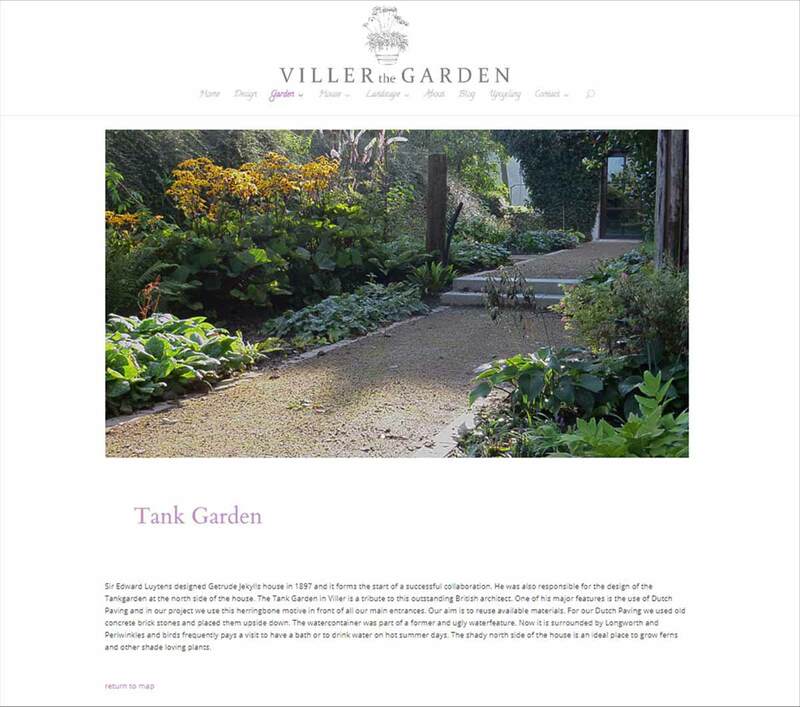 But also rose gardens and planting plans for steps and walls are described in detail. In addition, the beautiful photos from Andrew Lawson and the coloured additions to Jekyll’s originals by watercolourist Liz Pepperell make this an absolute must-have book. This book is also translated into German. Last week storm ‘Friederike’ killed our old plum tree. For many years it served as coat stand for the jacket of Mr Bobby James. It was inevitable that we had to fell our old plum tree sooner or later but it was Friederike who took the decision. After it fell on our Cotoneaster hedge, we had to shorten the long twigs in order to free the trunk and to saw it in pieces. But here in Viller Friederike refrained herself and besides a few broken roof tiles, the storm was fortunately not a big problem. The calm weather of the last days gave me the opportunity to take some pictures of flowering shrubs. 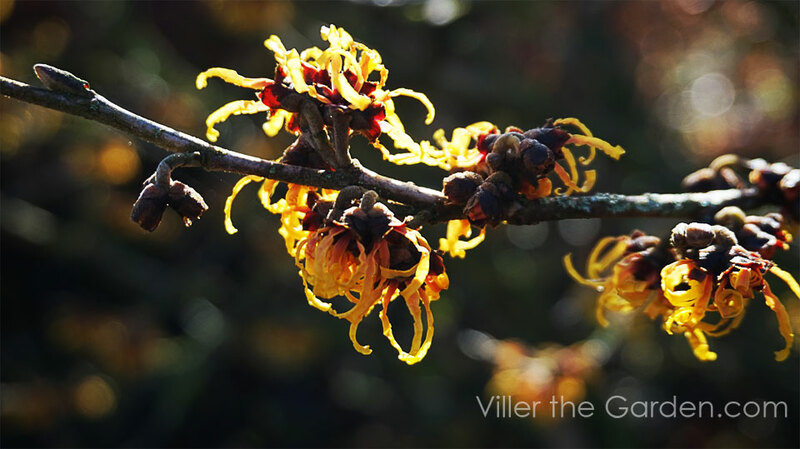 As usual, I took some images from the ever-photogenic witch hazel (Hamamelis mollis) which first flower buds already started to unfold on the last days of December. 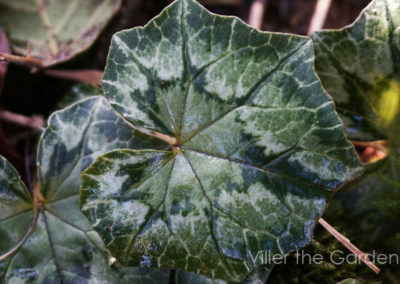 But it was especially a nice bunch of Cyclamen coum with its lovely rounded heart-shaped leaves which caught my eyes. I planted some tubers a few years ago and after a difficult start, it finally is going to spread. Besides the lovely pink, magenta or white flowers, I like the silver variegated leafs. 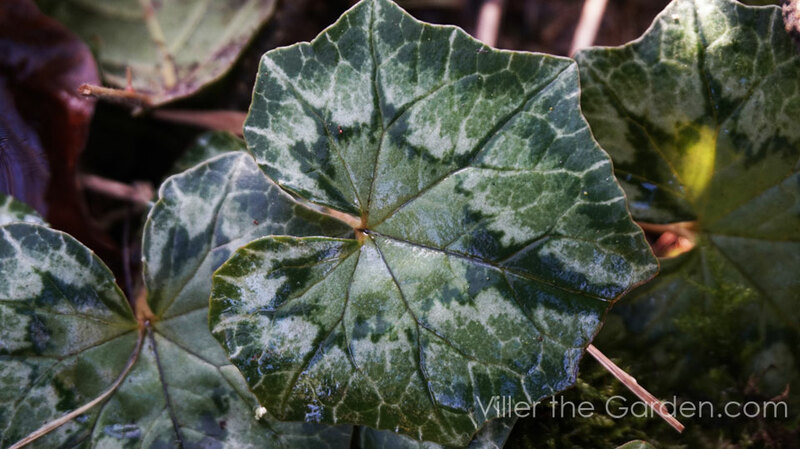 The silver coloured Christmas tree pattern on the leafs of Cyclamen hederifolium are even more spectacular. Their flowers though started to unfold at the end of the summer. 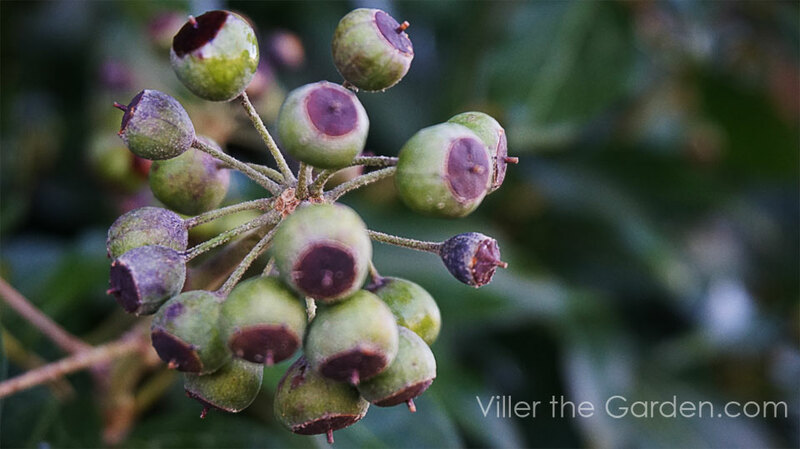 The shape of the leafs of the former plant reminds me of the ivy and especially its greenish-yellow flowers which now are ripened into purple-black to orange-yellow fruit. 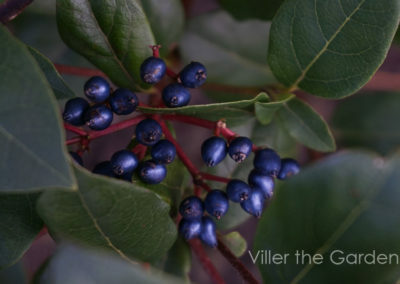 They are an important food for many birds. 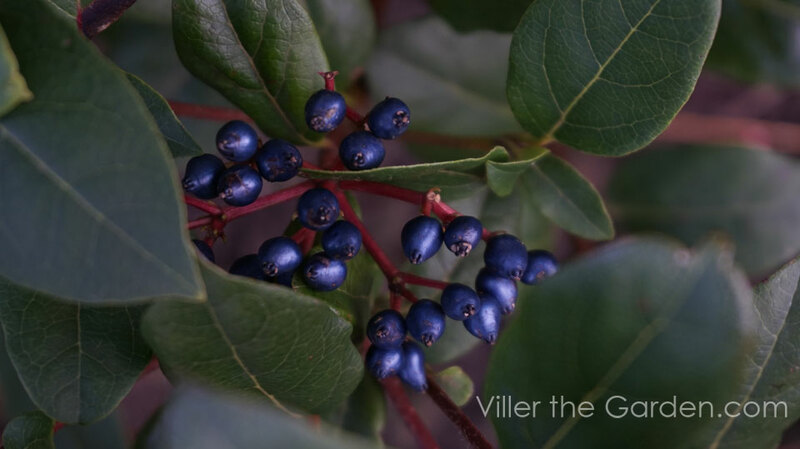 The colour combination of the blue metallic berries on the red stalks of the Laurustinus (Viburnum tinus ‘Gwenllian’) is flabbergasting. 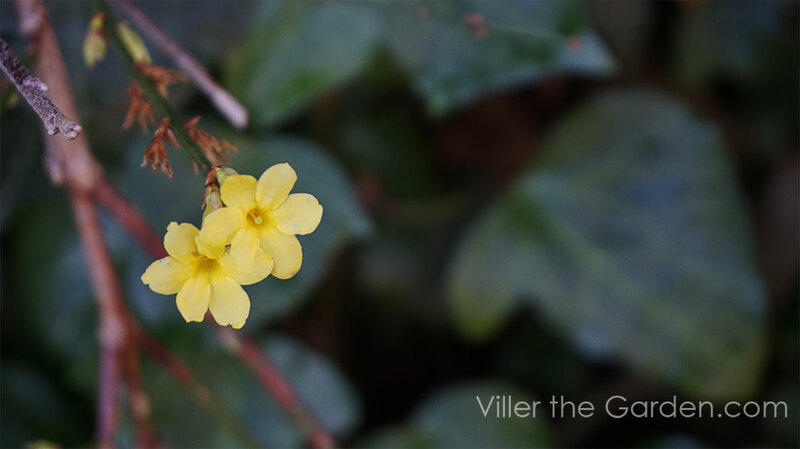 The tincture of this fruit has been used lately in herbal medicine as a remedy for depression.The winter jasmine which already started to flower in December shows now a lot of flowers. Unfortunately, this climber was planted on a shady wall. I recommend planting this Jasminum nudiflorum against a south facing wall to get the most out of it. By the way, here in Germany you can sponsor a low and give it a name. For 199 euros your name can be the talk of the day and shown on the headlines of the newspapers( Institut für Meteorologie). Doro prefers to receive a high as a gift but I have to dig deep into my pocket. It cost a hundred bops more. The Internet is the way to draw your attention to interesting books. The most common way is to read blogs like these or to sniff around the online stores. 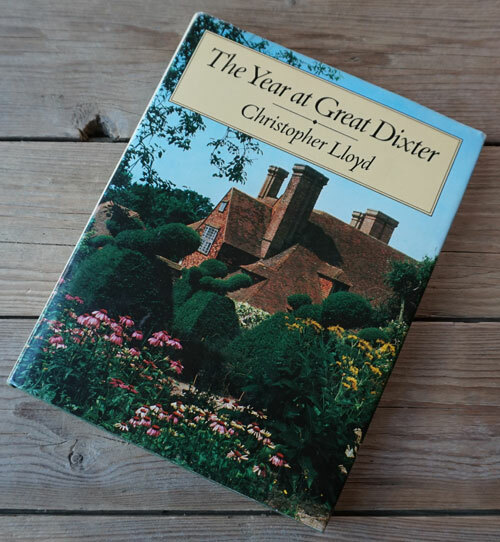 The book The Year at Great Dixter I discovered by watching an interesting interview with the author of the book: Christopher Lloyd. During the spring of 1987 Mavis Nicholson visited Great Dixter to meet the man who was one of the most influential garden writers of de second half of the last century. In a motherly confidential way she interrogate the somewhat shy bachelor on his youth, his loneliness and on what will become of Great Dixter after the writer dies. The answers are revealed by watching the YouTube film. 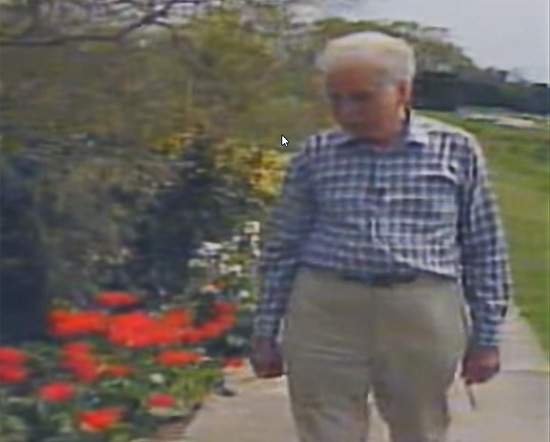 The interview is interspersed with haunting film clips of Lloyd walking through the springtime garden. 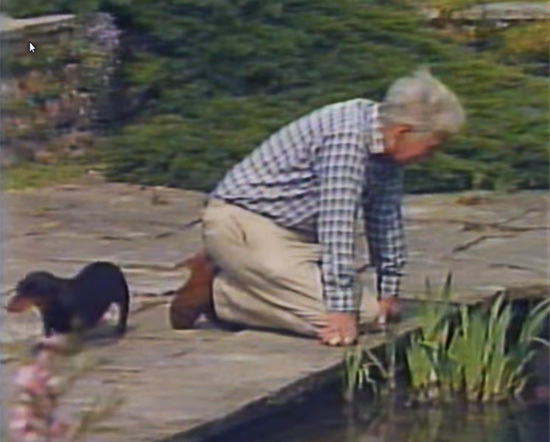 Sitting on his knees weeding and always accompanied by one of his charming dachshunds. 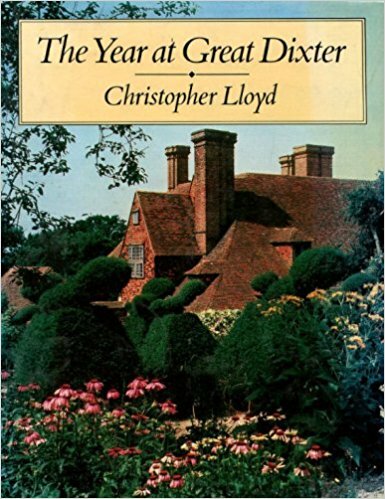 This rather unknown film captures Lloyd and Great Dixter at a time at which the old rose garden was still there and where his head gardener Fergus Garrett was not yet in view. 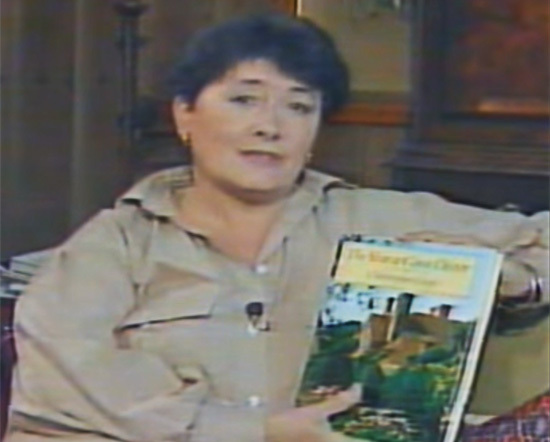 But the reason why I am telling you this story lies at the end of the interview where Mavis Nicholson is presenting the just-released book of the writer. After all these years this book lies now in front of me. Although I bought a book in good shape the dust jacket shows some signs of wear. The photos are undeniable dating from the eighties and the same applies to the way of writing. Nevertheless, I really admire the humorous way he commits his thoughts to paper. On the month January he writes: ”I know there are those who say they love the winter and witter on about its crispness and sparkle and the inspiration of your breath hanging on the frosty air (not to mention the dewdrop on the end of your snotty nose), but on how many days in January do you actually see the sun?” This is unmistakable Lloyd’s witty way of reporting on his beloved garden. 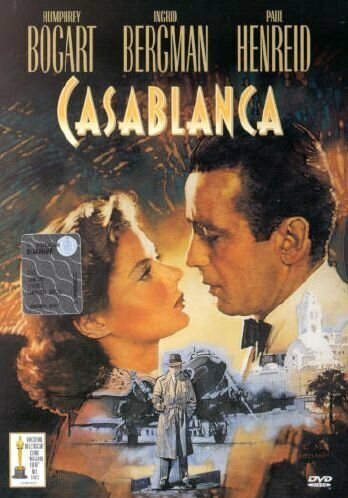 The melody “As time goes by” was sung by Sam (Dooly Wilson) in the film Casablanca which film gradually grew in popularity and consistently ranks near the top of lists of the greatest films in history. Heartbreaking is the scene in which Ilsa (Ingrid Bergmann) asks Sam to sing this song. Watch her eye movement at the 1.29 minute on which she remembers a moment in the past which will never come again. November was soggy and wet and December started pretty cold. So nice weather to do some other pleasant things than gardening. 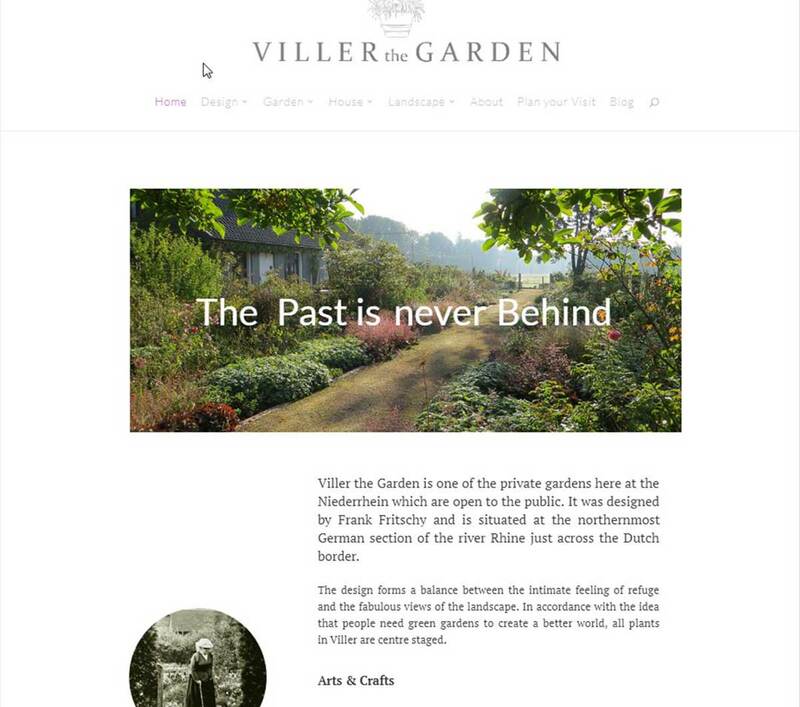 In the last few months, I worked from time to time on a huge update of the Viller the Garden website. But due to this awful weather, I could spend some more time to finally accomplish the job. 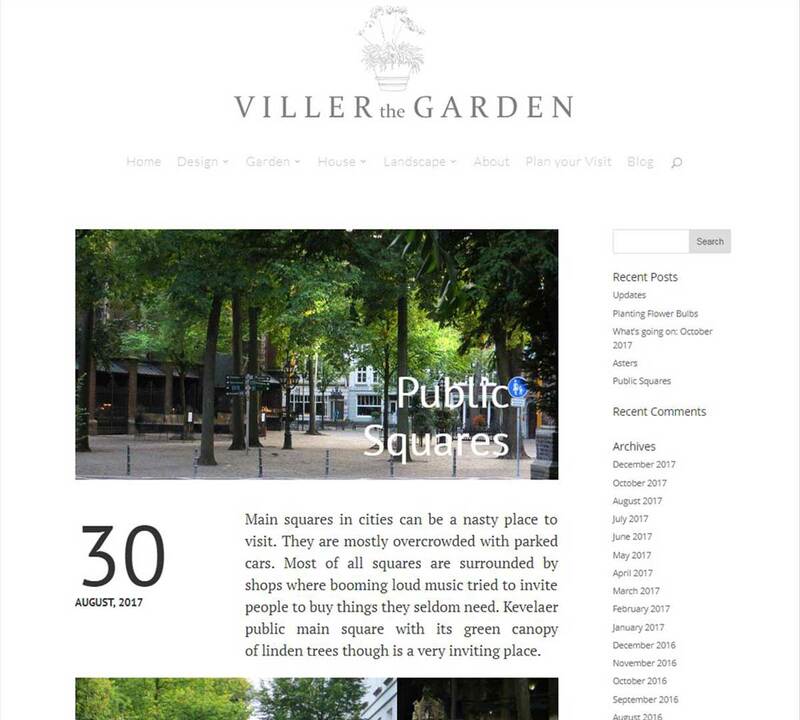 In the end, it turned out that I have been creating an almost completely new website. At the end of this summer, I started already with building the animation on the Home page. By doing so I could with a simple transition depict the slogan The past is never Behind. This short animation captures exactly the essence of our garden concept. To improve the readability I choose a bigger serif font and placed some subtitles at the start of a paragraph. In addition, I changed the whole layout into a more glossy magazine look. Especially on my blog, I tried to make things more readable by carefully placing photos and adding a quote. I added new blogs and edited the old ones. Furthermore, it is now not only possible to see the date on which the blog is created, but also the moment that it was edited and updated. 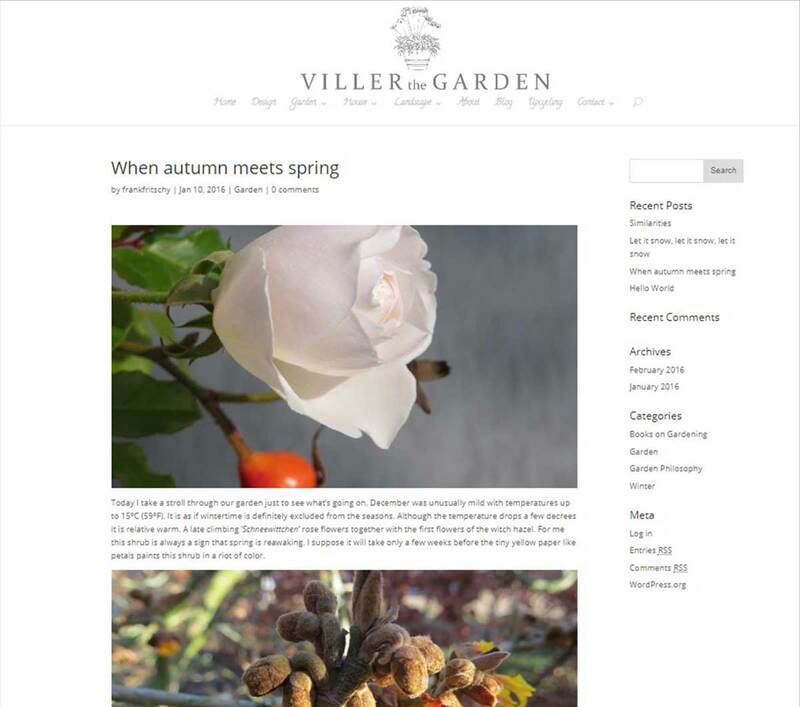 I inserted links to other websites mostly to sites with topics on gardening or music. When I reviewed books, garden tools, DVDs or other stuff I made a direct link in order to see further details and to have the possibility to buy them. To compare the old website with the new one, I included in this article for you some ‘before-and-after’ images to see the difference. 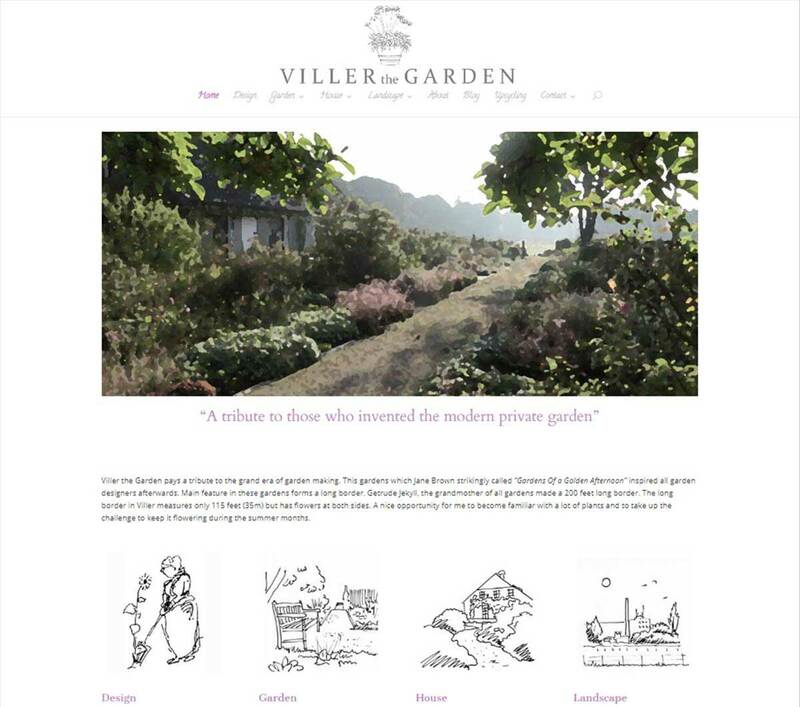 For Doro and me a permanent reminder of our first garden website and how it all started a few years ago to inform the world about our project. Finally, nature is also working on an update and most plants don’t need so much time. 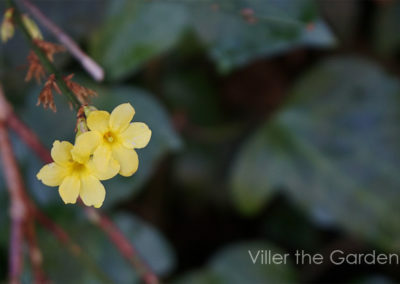 Our winter jasmine (Jasminum nudiflorum) already showing its flowers. 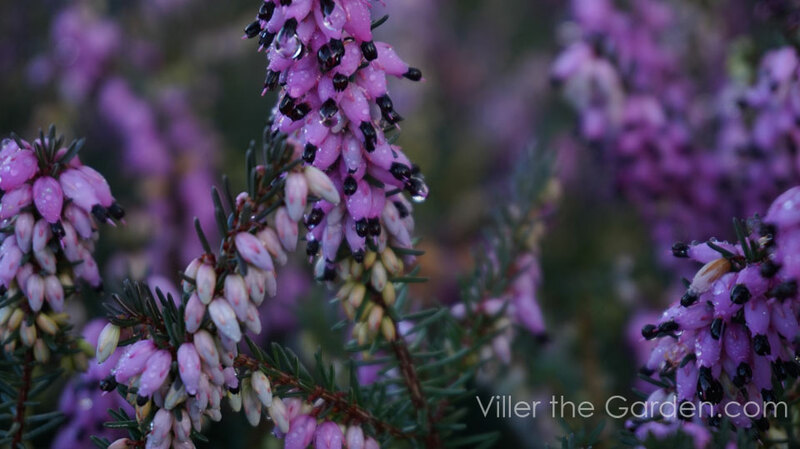 This lovely winter flowering shrub was already planted as we arrived here in Viller. It was planted in a sheltered but shady position and that’s the reason why it stays low and only showing a few flowers. 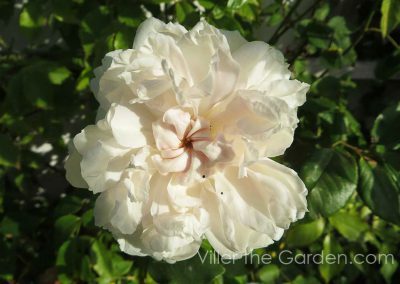 My advice is to plant the winter jasmine in a sunny sheltered position and it will grow to a 10 feet tall and wide shrub. 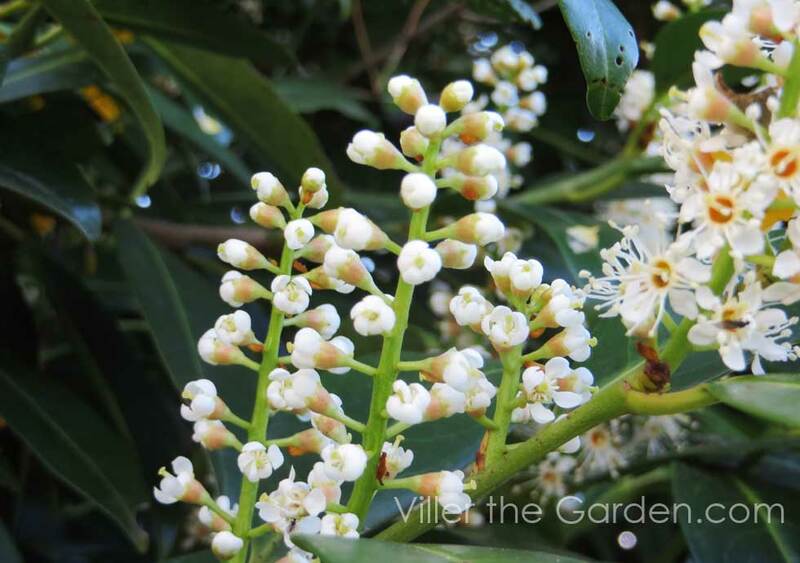 Nice to hear that this plant is already naturalized in France. 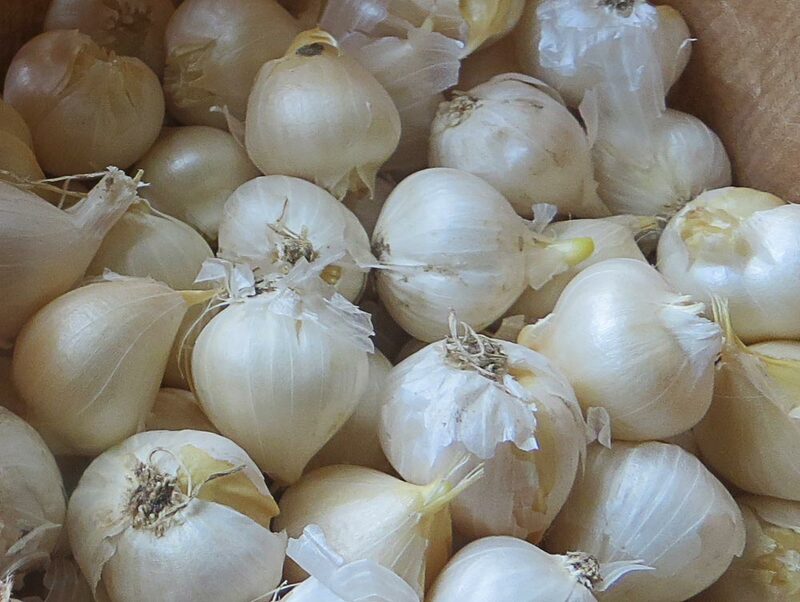 Planting flower bulbs is like cooking a delicious meal. Before you can serve your awesome plates with your creation you have to carry out a lot of preparations. In order to surprise friends with your ‘culinary’ creation, I will give you some tips. It all starts with making a shopping list. Your ‘dinner’ should be varied and balanced. Images in bulb catalogues are like recipe books and can offer you some beautiful bulb combinations. 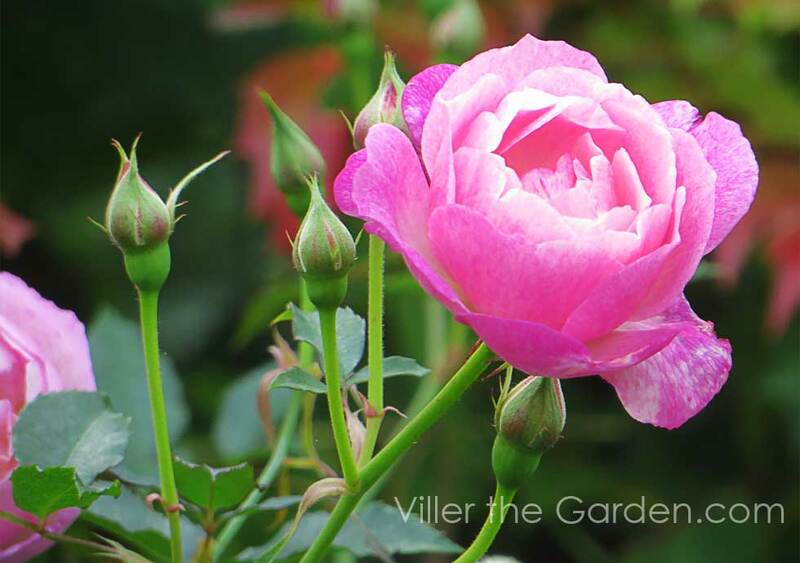 Are you looking for daring combinations or should your planting be more sophisticated? The nice thing about planting bulbs is that you can change your display every year. In the Long Border here in Viller we are going next year for just one combination. Tulipa Spring Green with Forget me not’s. Or to say it with other words: only a main dish. If you prefer three-course meal you can plant snowdrops as a starter, daffodils as a main course and late flowering tulips as a desert. Shopping and cooking on the same day can be very risky because some of your ingredients can be temporarily sold out. I ordered my bulbs in October which is pretty late. As a result, I had to surf an hour on the internet to find the last 15 Camassia leichtlinii. Order in August and you won’t be disappointed. The best way is to plant your bulbs right away. 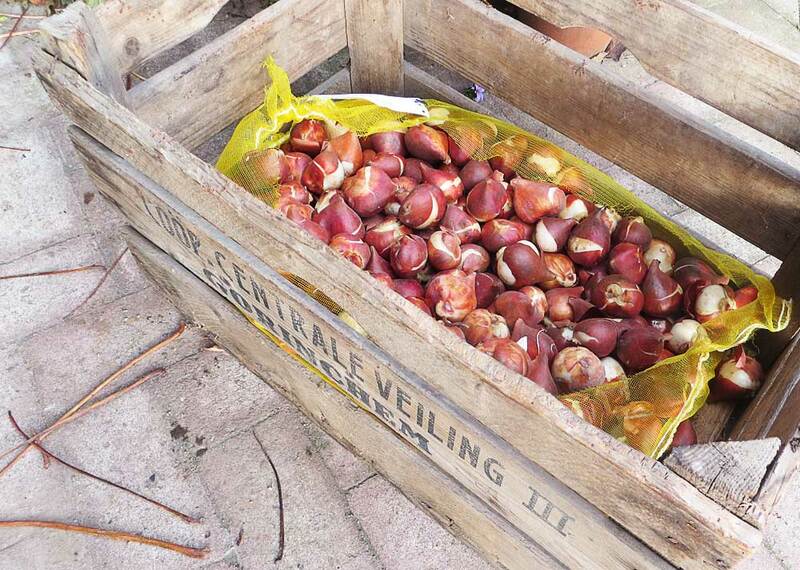 If you are not able to plant them immediately you have to take your bulbs out of your parcel and store them cool and dry. In humid conditions, they can easily develop mould. Plant your bulbs not later than 6 weeks before frost sets in but I have to admit that I planted some in December with fine results. You don’ t have to worry about your soil. 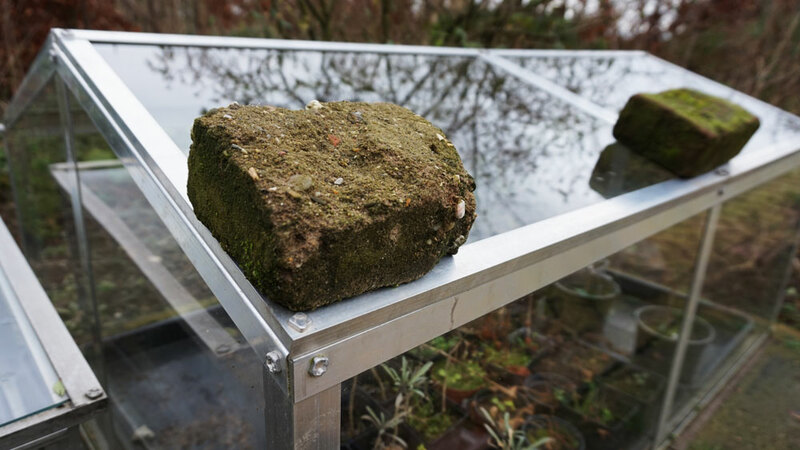 Only a wet soaked soil can cause a problem. Bulbs are like batteries. They are completely charged by the bulb grower. If you renew your planting every year you will never be disappointed. If you prefer to leave your bulbs in the soil you have to feed them with manure and a fertilizer but even than blooming flowers are not guaranteed. There are (mostly small) bulbs which are able to naturalize in your garden like snowdrops, crocuses and some early tulips. 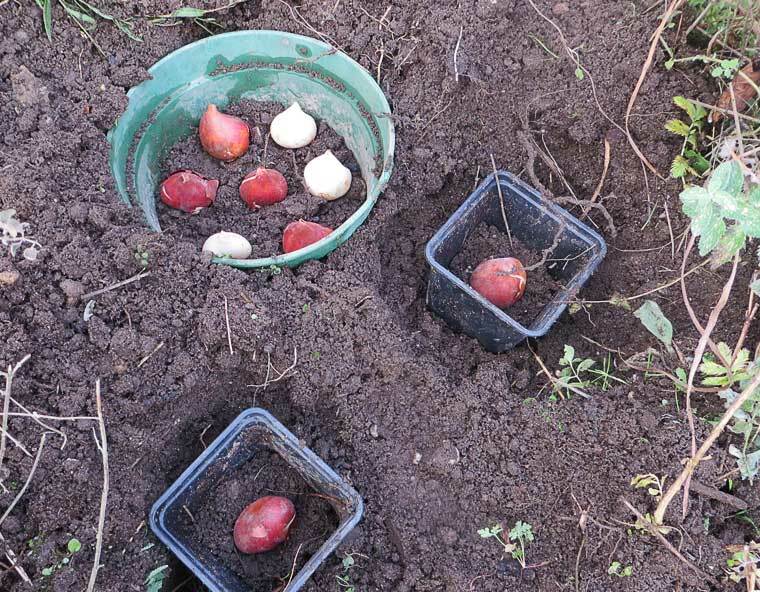 It is safe to plant your bulbs in containers to protect them from mice and other small rodents. You can use all your leftover containers from your perennials. In small-sized containers, I put just one bulb but in a large one, you can easily plant 5 or even 7. Thus you can make all the combinations you want. The most important thing is not to plant them in a stiff row. Daffodil bulbs are poisonous to rodents so they leave them alone. 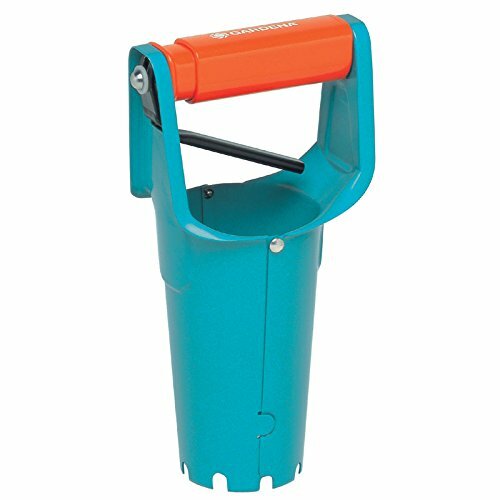 You can plant them with an ordinary quality bulb planter like the Gardena which I use already a few years in a row. The handle to release the soil is very handy (see pictures below). The Garland planter releases its soil by pushing the red knob in the middle. In meadows, you can use a long-handled bulb planter. Although I own a beautiful Burgon and Ball planter I cannot recommend it. On heavy clay soil, you have to sit on your knees to remove the soil plug. 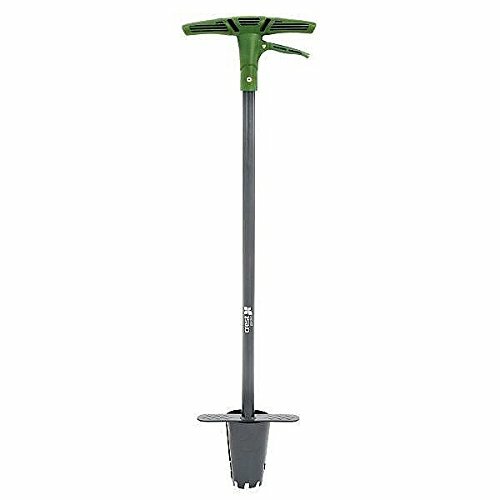 To do the job in an upright position it is better to use a planter with the same kind of handle as the Gardena like that from crest (see pictures below) or the pro plugger which they sell in the states. 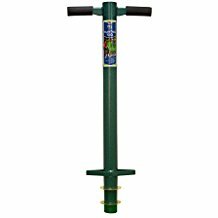 Keep in mind that these long handle bulb planters are working best in sandy or compost-like soil. 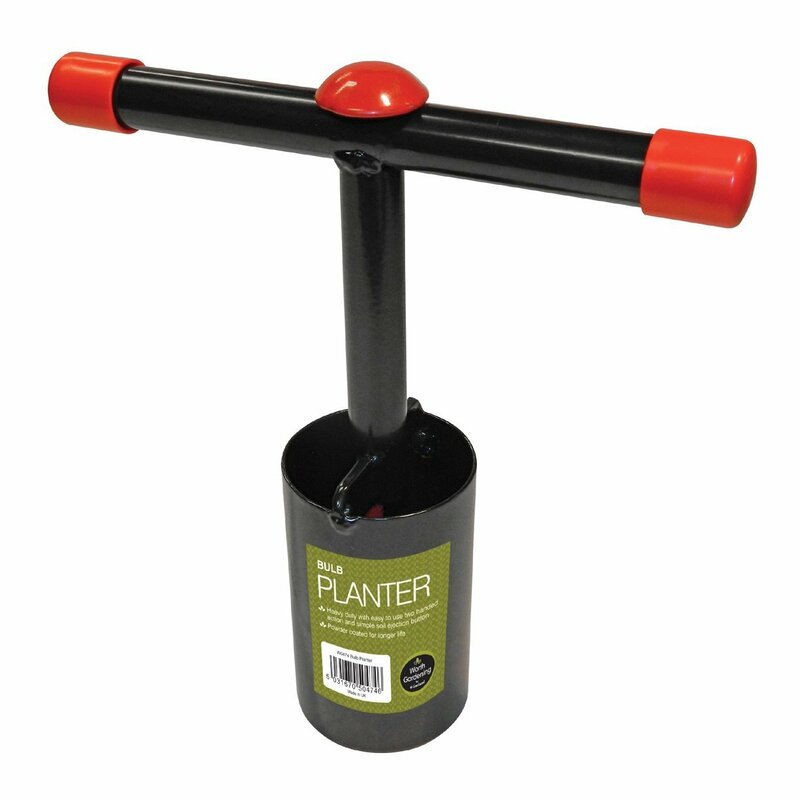 When using these planters on moist clay or rocky soil all plugs get struck in this garden tool. Cover your bulbs with soil and try to make a plain surface is like setting the table. Your work is done and nature is going to cook your meal. Just sit and wait and watch a miracle to take shape. Enjoy your meal! The second week of October started pretty cold but then the temperatures started to rice. We are now already in the second half of October but due to lovely weather with temperatures around 20 degrees, there is still much to enjoy in our garden. As chlorophyll breaks down we are able to see other colours than green. 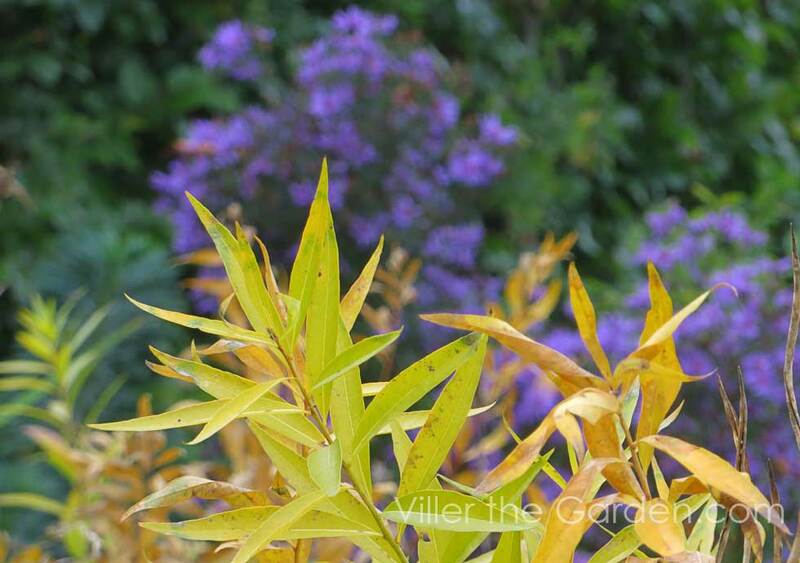 The leafs of the Amsonia tabernaemontana (Bluestar) turn their green colour into a gorgeous buttery yellow which made a pretty cool combination with the dazzling blue of the Aster ‘Treffpunkt’. 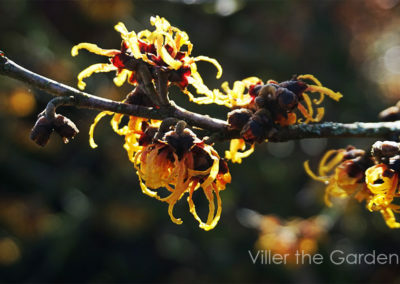 Probably the most stunning combination is the half-hardy perennial Salvia farinacea ‘Victoria’ in front of a Hamamelis mollis. 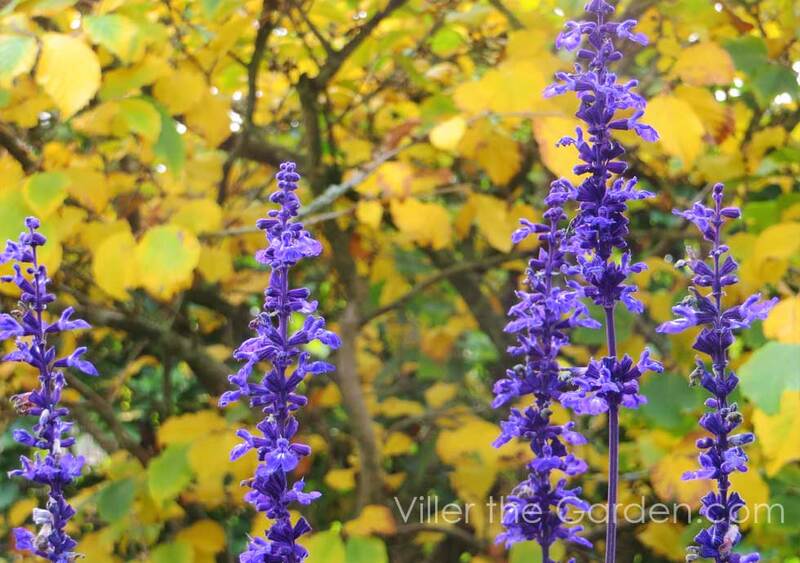 Combinations in October can be pretty cool like these spikes of Salvia farninacea ‘Victoria’ in front of a Hamamelis. 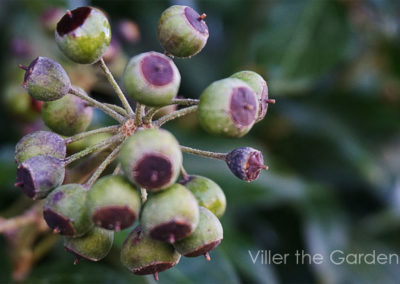 This is also the time of the year that some shrub flowers changed into colourful berries. 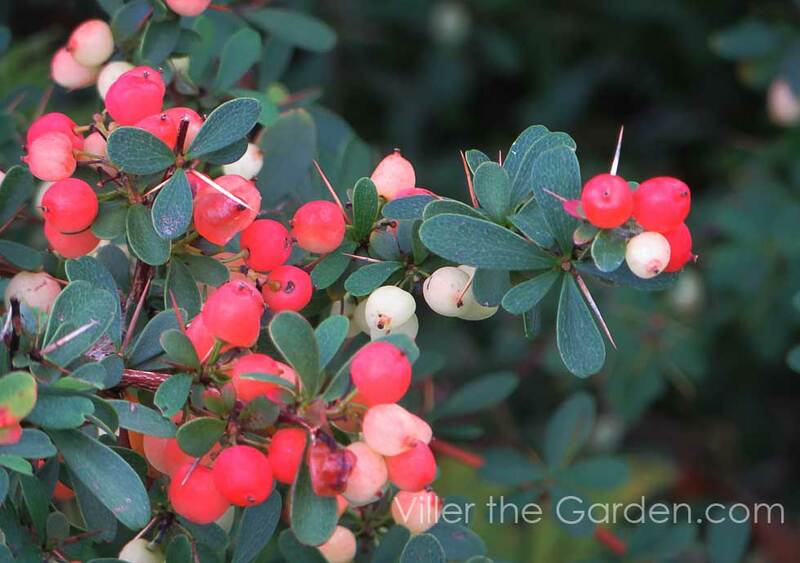 The one of Berberis willsoniae (Mrs. Wilson’s Barberry) changed gradually from a buff colour into a scarlet red. And contrary to the common opinion that birds leave the berries of the Pyracantha (firethorn) alone I must say that these shrubs are now pretty robbed from there orange-red display. Berberis wilsoniae was introduced by Ernest Wilson in 1904 and was named after his wife. In late summer I removed almost all the affected leafs of the reblooming roses. 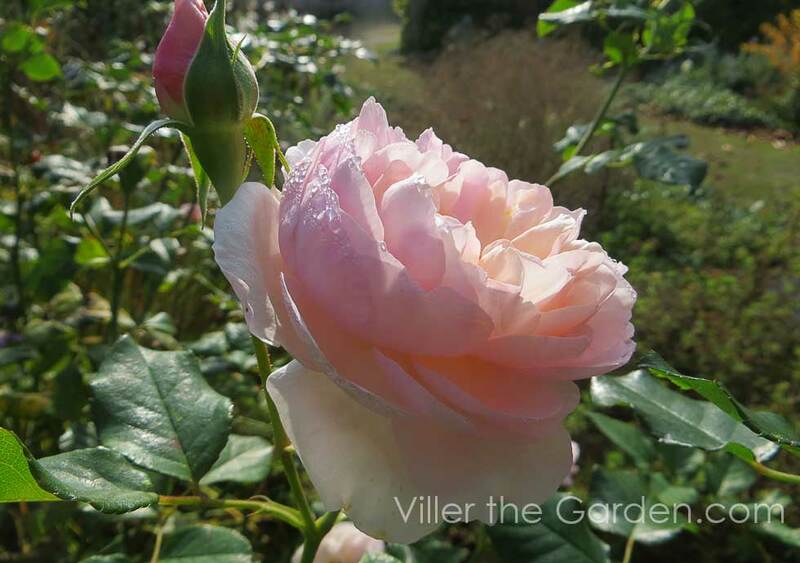 Mildew and Blackspot made them unsightly and I reported on this incident in my Rosenkavalier blog. And although I am still not able to present a rose made out of silver I am now able to present a lot of beautiful roses with a tantalizing perfume. They even show a bushy growth of healthy glossy dark green leafs. On visiting a lovely cottage garden of friends last year, I stumbled over a colourful display of Asters and a few weeks ago I planted some of them myself to enjoy their daisy-shaped flower heads during fall. Asters are lovely perennials which can add colour to your border well into October. 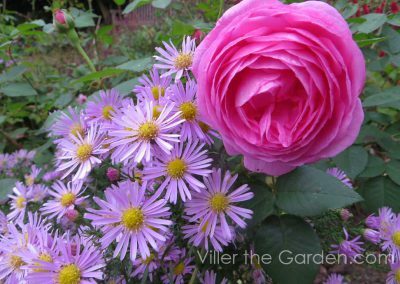 Gertrude Jekyll was mad about them and she planned even two borders at her garden at Munstead Wood were these Asters play the leading role. 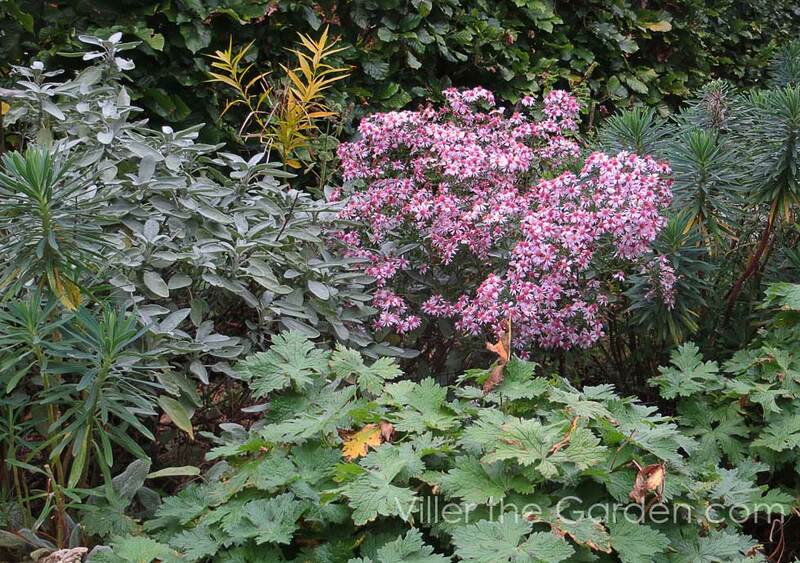 Her September border was located in the middle of her kitchen garden and was backed at each side by a Hornbeam hedge. “ This border is mainly for the earlier Michaelmas daisies; those that bloom in the first three weeks of the month”, as she wrote in her bestseller from 1908: Colour Schemes for the Flower Garden. 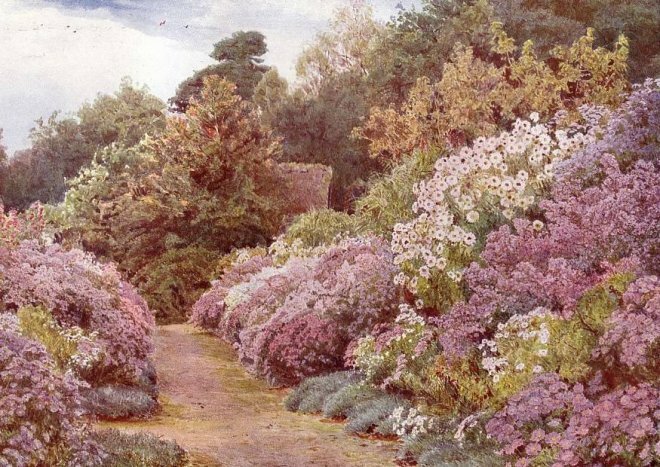 Her borders for the October flowering asters, so perfectly portrayed by artists like Helen Allingham and George Elgood, were situated more closely to her house. The care and preparation for the mass display in Autumn must be tremendous. Large asters at the back of the border had to be staked and by careful pruning, her gardeners could manipulate flowering time and height. Asters are especially suited for a cool colour scheme and Jekyll planted an edge of grey-leaved pinks to enhance this effect. 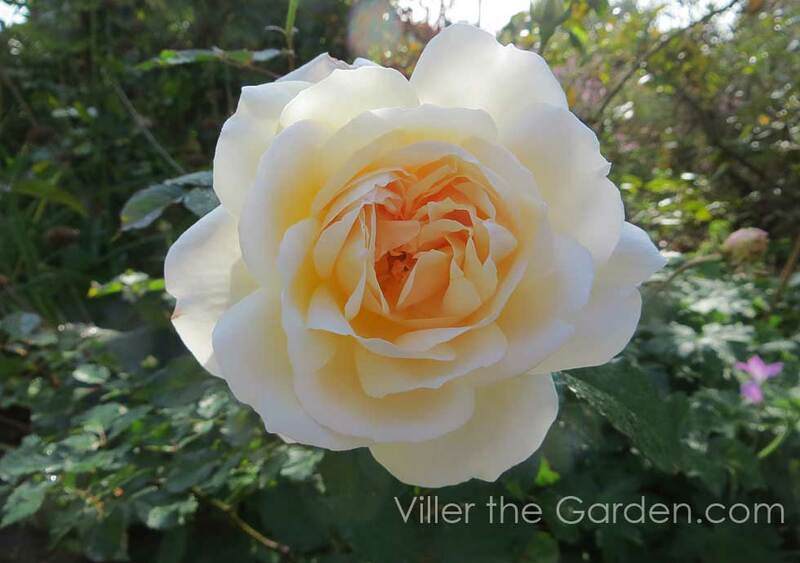 Here in Viller the Garden we planted some varieties in late summer and after a good start, they are already showing bunches of flowers. 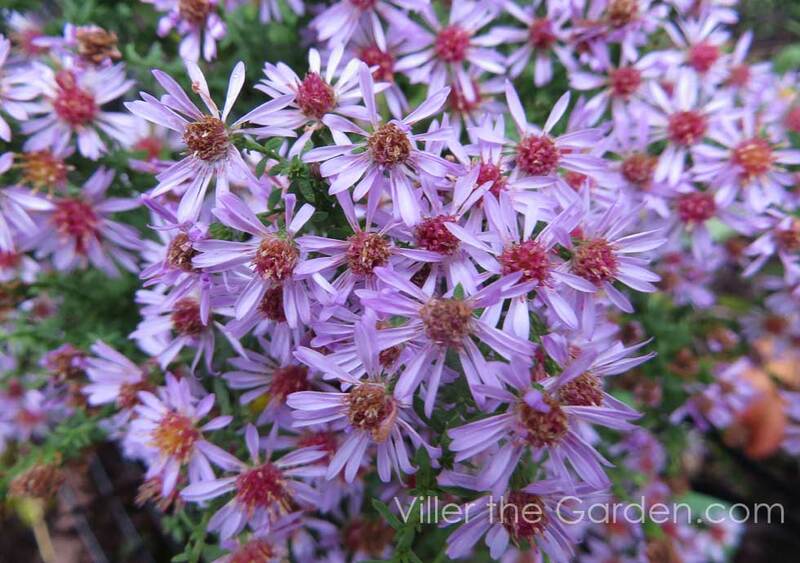 I am especially fond of the asters with tiny flowers and a bushy appearance. 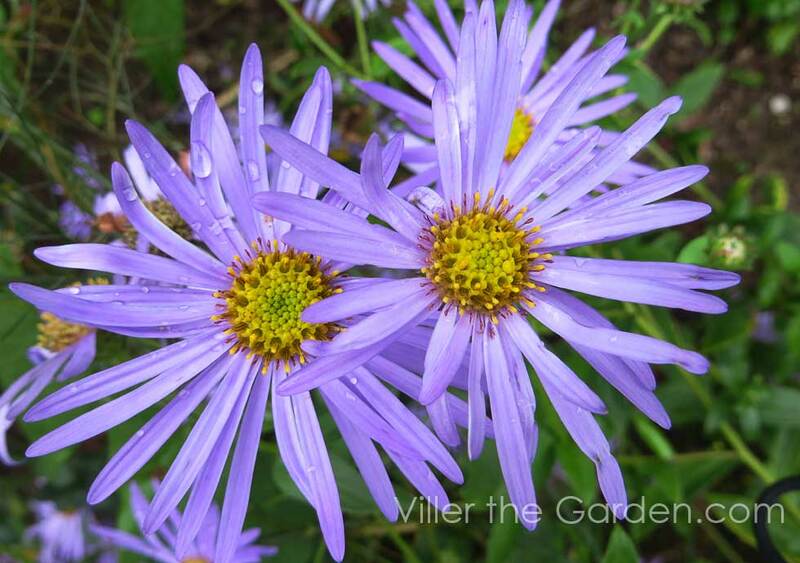 Aster lateriflorus ‘Coombe Fishacre’ is one of them. She shows her little pink flowers already in September. 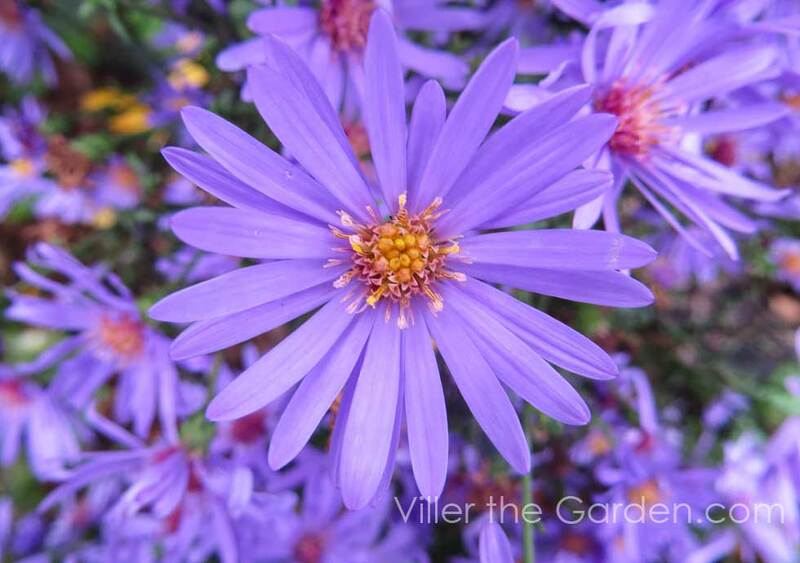 Aster vimineus ‘Lovely’ with its mauve coloured flowers is also well-branched but stays below 2 feet and is a good plant to place in front of your border. I tried to avoid staking and there are a few new breeds with good sturdy stems like Aster ‘Treffpunkt’ which is probably a hybrid between an unknown Aster Novi Belgii and Aster cordifolius ‘Blue Heaven’. Its luminous blue-purple colour is very special and is not only attracting the attention of visitors but also of bees and other insects. If you want more height and if you are looking for a plant for the backside of your border, an Aster ericoides ‘Pink Spray’ could be the right choice. It has small pink flowers and starts flowering in the second half of August. Most Asters need a sunny place but Aster divaricatus originates from the woodlands of North America and tolerates more shade and accepts more dryer soil conditions. I appreciate its ground covering qualities and its mass of tiny white flowers on almost black twigs which makes it a very versatile plant. 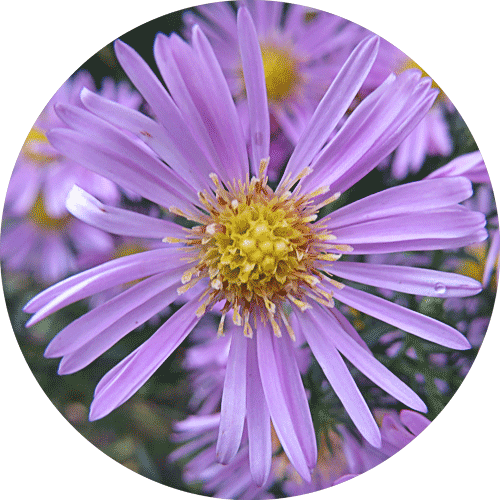 Although Asters are Autumn plants par excellence there are a few asters with a very long flowering period and which open their first flowers in July. 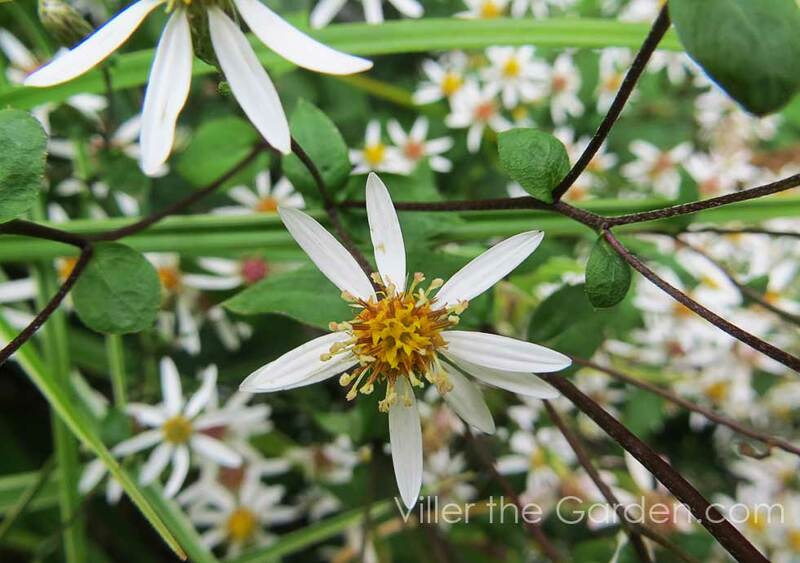 Aster x frikartii ‘ Monch’ is one of them and its lanky growth can be improved by deadheading by one-half at the end of May or early June in order to improve its habit. Aster ageratoides adustus ‘Nanus’ even starts flowering in June but most plant lovers know this plant as Kalimeris incisa ‘Nana Blue’. Paul and Helen Picton are real Aster connoisseurs and there famous Picton Garden in Worcestershire (UK) shows over 400 varieties. 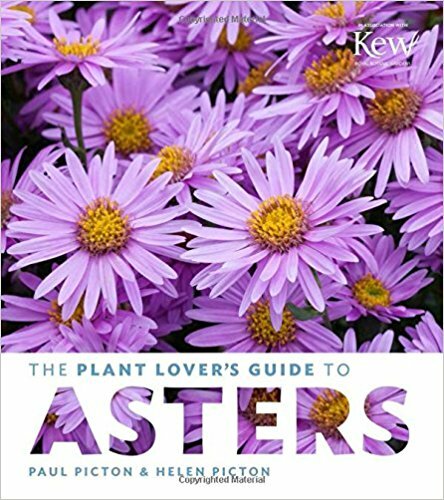 In the famous series of Plant Lovers Guides, they wrote a beautifully illustrated book on Asters which I can highly recommend to you. 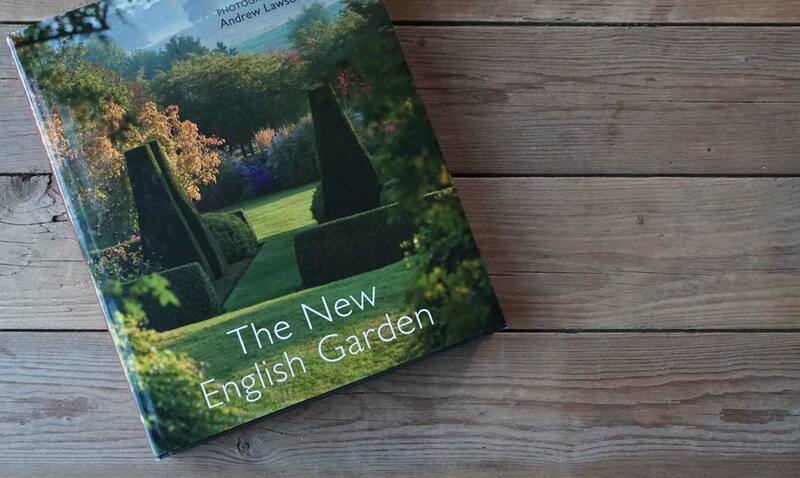 The title New English Garden is almost a contradictio in terminis because English gardens are in a way traditional. Most new planting trends started on the mainland but are now gradually blending with the more traditional way of planting of the British to create a unique style of its own. 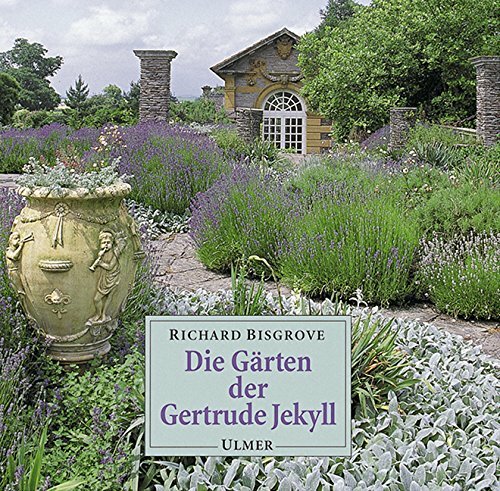 You will find some traditional elements of English gardens in this book like the long border at Great Dixter and the herbaceous planting of Gresgarth. 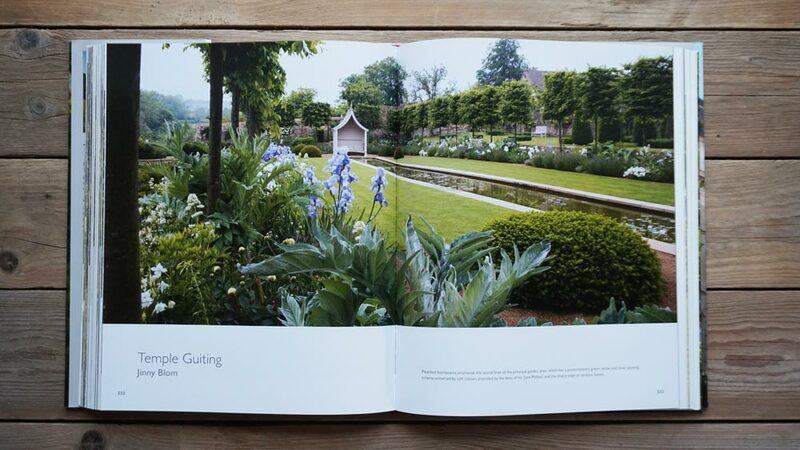 Although both designers of these gardens were not professionally trained, they deserve a prominent place in this book. 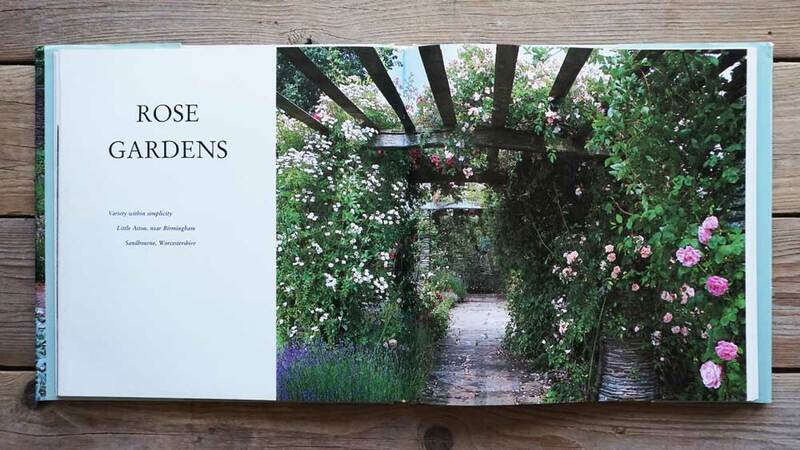 With the daring plant combinations at Great Dixter, Christopher Lloyd paved the way for the adventurous and colourful planting style of Piet Oudolf or Dan Pearson which are of course also represented in this beautifully illustrated book. 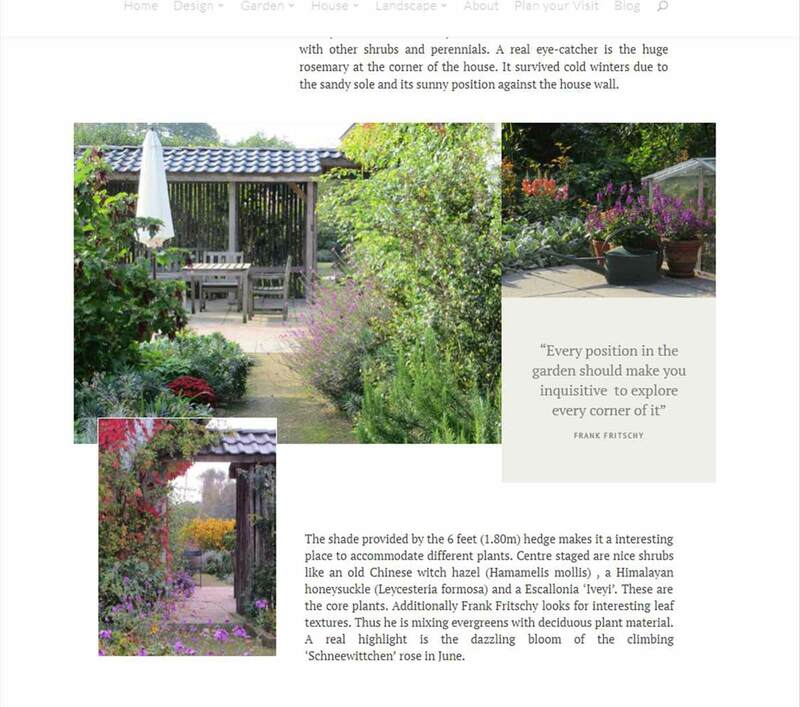 Arabella Lennox Boyd sense for space was highly praised by a professional garden and landscape architects and her lovely creation of Gresgarth was the start of an international career as a garden designer. Lovers and fans of gardens of using plants in a more sculptural way will doubtless enjoy the Lynn garden designed by the Belgium duo Jaques and Peter Wirtz or the topiary sculptures created by Gina Price. Lovely are those designs which link the garden with the enchanting landscape like Mount St. John from Tom Stuart Smith or Plaz Metaxu designed by Alasdair Forbes. Piet Oudolf has a tremendous influence everywhere on this globe where the climate is suitable to grow perennials. No wonder that the Dutchman has a hand in a lot of designs presented in this book. My personal favourite is Jinny Blom’s Temple Guiting where she combines sleek modern architectural forms with an interesting planting. 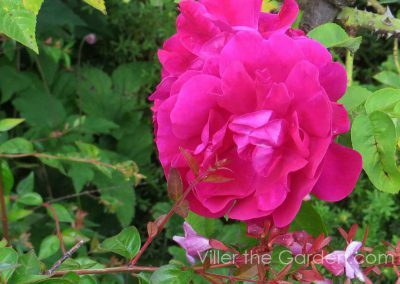 This time no Dutch wave planting influence but historically inspired combinations like roses, irises and foxtail lilies (Gertrude Jekyll sends her greetings). 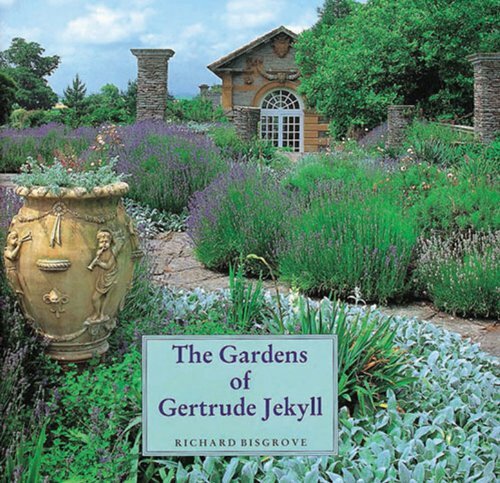 As an English garden architect, her designs are probably mostly in accordance with the title of this book. 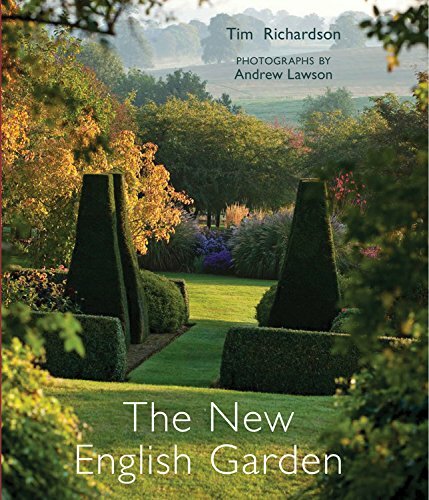 Tim Richardson did a marvellous job by writing a book which is already a classic and will probably become the most influential book on English planting design from the beginning of this century. Through his analytic and critical approach, you will get a thorough understanding of the concept of every individual garden. The photographs of Andrew Lawson are superb. 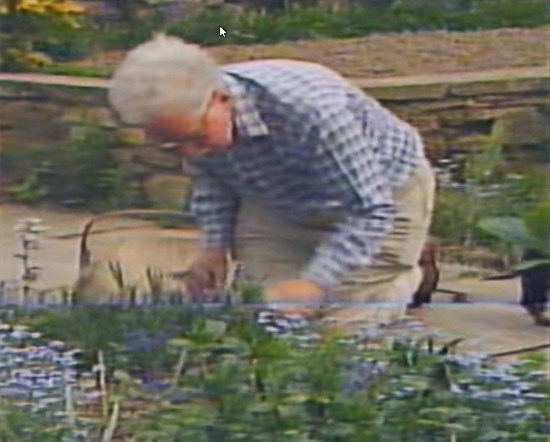 Watch his image of Scampston Hall and you immediately recognize that he is one of the most prominent British garden photographers of his time. Publisher Frances Lincoln made the right decision to print this book in a large format to do justice to the quality of the photos. The only drawback is that it is not handy for bedtime reading and that is exactly the place where I prefer to read my books(sigh). 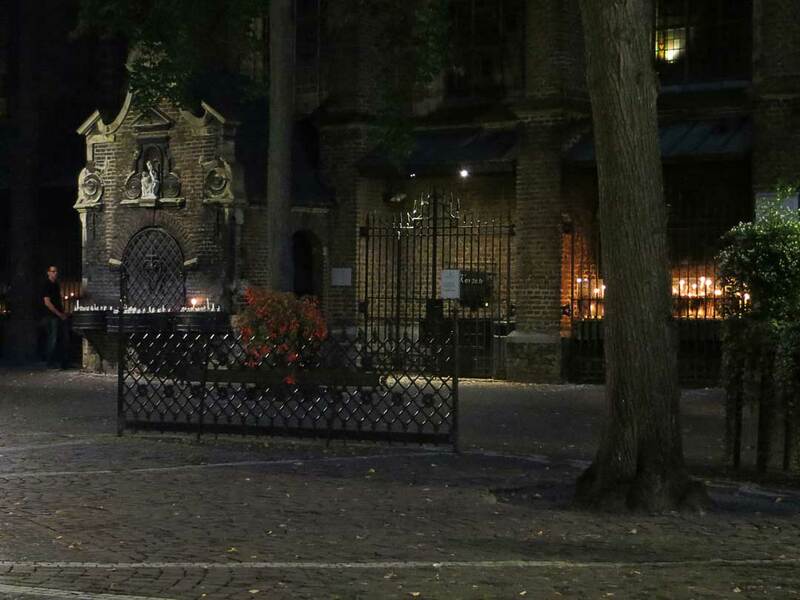 Main squares in cities can be a nasty place to visit. They are mostly overcrowded with parked cars. Most of all squares are surrounded by shops where booming loud music tried to invite people to buy things they seldom need. 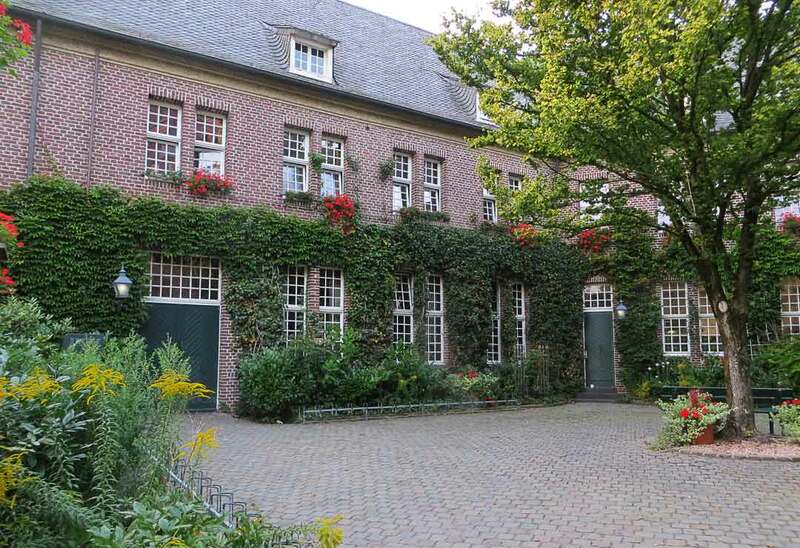 Kevelaer public main square with its green canopy of linden trees though is a very inviting place. 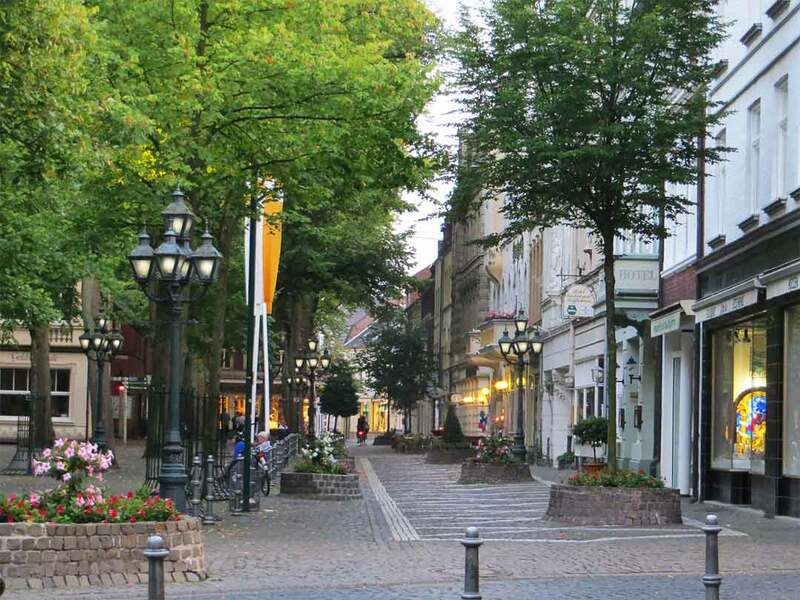 Here at Niederrhein, where we live, sadly you will find a lot of ugly city centres. Bombed at the end of World War II and tastelessly rebuild they are wisely omitted in most tourist guides. Places like Emmerich and Goch are, due to online shopping and lack of creativity, growing into a kind of ghost towns. Once a week though market stalls improve the situation a little. Bustle and vitality are returning for a short moment. Squares are mostly open places and pedestrians seldom cross them diagonally. People prefer to stay close to the facades of the houses and shops. This is often the spot where a row of trees gives some shade on a hot sunny day. Furthermore, they form a precious addition to conceal the stone fronts of the dull houses. 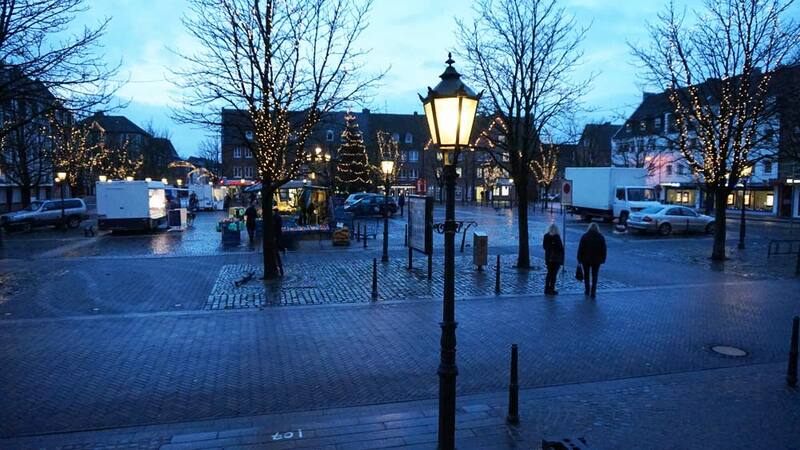 The main square Kevelaer city is completely different. It is scattered with linden trees and cars are banned. Granit cobble stones reinforce its natural character. In addition, all these trees give pedestrians a secure feeling to cross this square all over the place. 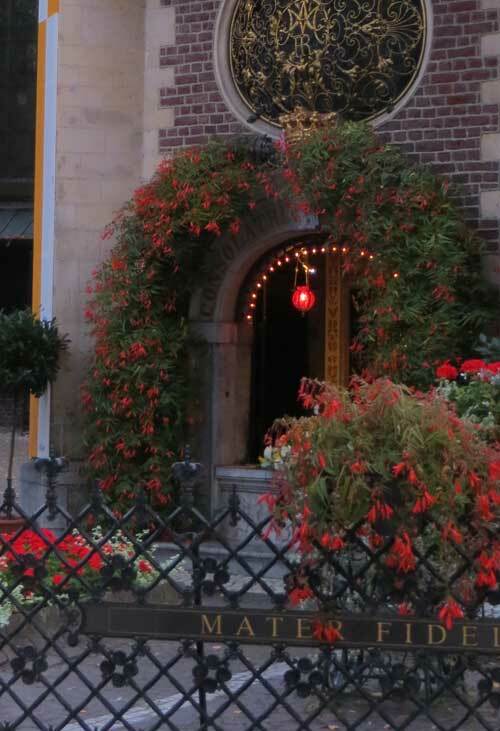 Some houses are covered with Parthenocissus tricuspidata (Boston ivy) and hanging baskets are all around. These baskets can sometimes be kitschy, at the same time they reflect the love for flowers and the continuing commitment to care for them and show them at their very best. 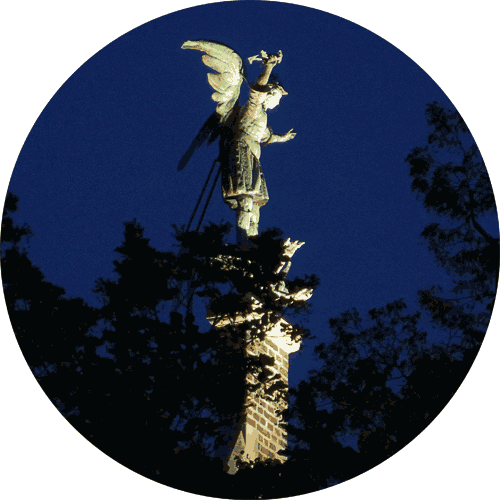 Its main landmark, the high tower of the imposing pilgrimage church, can be seen from whatever direction you approach the town and draw all the visitors to the main square. 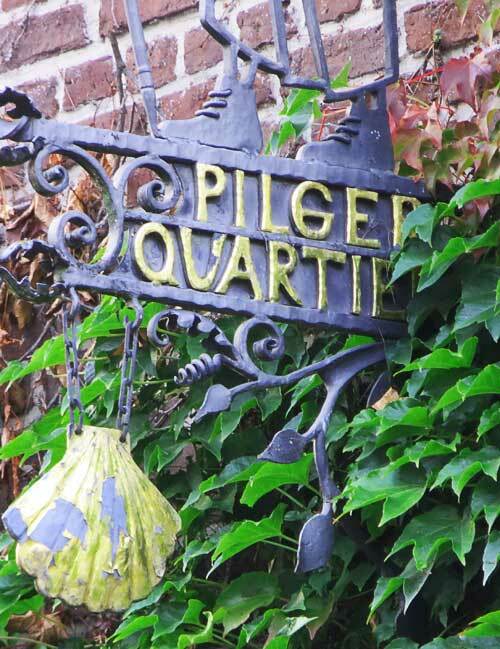 In the summertime, we are often visiting Kevelaer to drink an espresso on Petra’s terrace and to watch the foot traffic, to enjoy the dappled shade of the trees to hear the murmur and praying of the pilgrims. No annoying music from shops or cafes but just tingling bells. When darkness sets in you can still watch all the oscillating flames of the candles or hear soft singing during a procession. 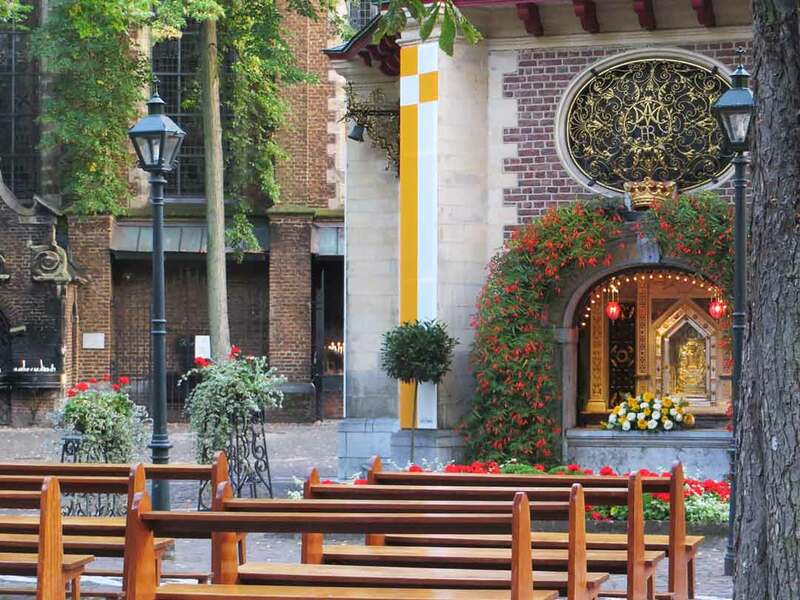 What is Kevelaer’s secret and makes this public square so special? Is it its sacredness or the lime canopy of the many trees or maybe both? God knows. 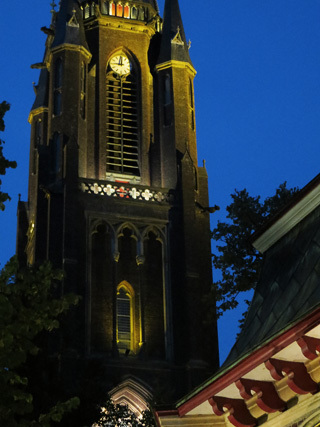 Its main landmark, the high tower of the imposing pilgrimage church, can be seen from whatever direction you approach the town.